Brushing, flossing, and regular dental check-ups are standard for oral health care, but there are some more things you need to know about dental care - dental caries. Check the myths and facts about dental caries below. Fact: Lack of oral hygiene causes dental caries. Dental caries is a complex disease influenced by many factors such as the nutritional status of individual, bacteria naturally present in the mouth, salivary flow, dietary behavior, oral hygiene, water intake and overall health. In people who don't brush their teeth twice a day with a fluoride containing toothpaste, frequent intake of foods or drinks containing fermentable carbohydrates such as sweets, fruit-juices, dried fruits, potato chips, etc. are known to cause tooth decay. Fact: It is a common myth that losing milk teeth due to tooth decay is insignificant because milk teeth fall out anyway. If cavities are left untreated in milk teeth, they can develop into serious pain and abscesses. It can also result in damage to the crowns of the permanent teeth developing below them. If milk teeth are lost prematurely, the permanent teeth may erupt malpositioned and require advanced treatment later on. Fact: Adults and elders are more likely to have chronic health conditions, like diabetes, which are risk factors for periodontal disease. Commonly used drugs such as antidepressants, diuretics, antihistamines and sedatives increase the risk of tooth decay by reducing saliva production. Saliva is vital in fighting tooth decay because it helps neutralize acids, has a disinfectant quality, washes away bacteria, and helps prevent food from sticking to your teeth. Lack of saliva, means that the mouth is getting cleansed more slowly. This increases the risk of oral problems. Also, in adults and elders, receding gums can result in root decay. Fact: Acidic foods such as lemons, citrus juices, or soft drinks don't cause cavities directly, but they may be putting your enamel in danger. Acids can cause erosion of the tooth-protecting enamel, weakening the tooth. If you lose the enamel's protection and expose the underlying dentin, your tooth is now more prone to decay. 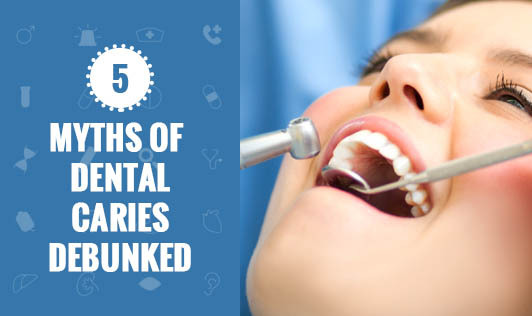 Fact: Mild tooth decay doesn't cause symptoms. The pain we associate with cavities comes when tooth decay is more advanced and causes damage to the nerve. Once a cavity starts, it doesn't repair itself. Once decay gets into the dentin of the tooth -- below the enamel -- it just continues to grow. Allowing tooth decay to advance can lead to much more expensive and painful procedures, like root canals. That's why regular dental checkups are so important.